While it’s not really feeling like spring in Philly (still! ), I decided to rebel and wear something short-sleeve yesterday anyway. Maybe if I act like it’s 70 outside, Mother Nature will notice? I noticed a couple of these dresses on the end cap and stopped because it seemed very LuLaRoe style to me. 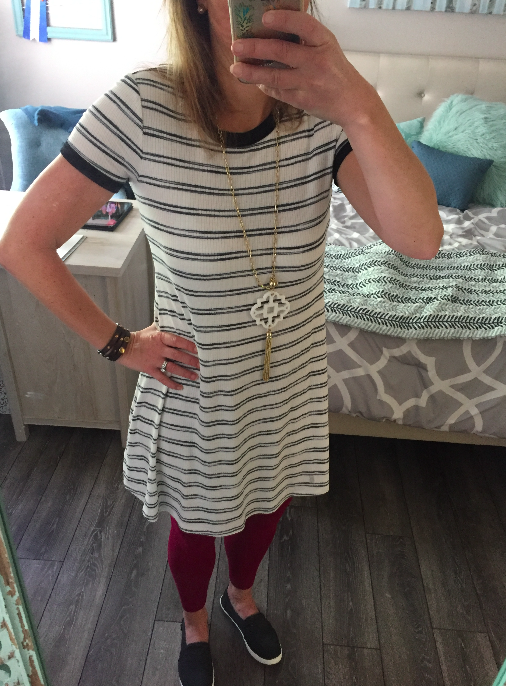 Of course, LuLaRoe is a pain to buy because you have to buy through a rep and it’s not cheap (dresses like this are $50). But this is the Mossimo T-Shirt Dressfrom Target and it is only $19.99! I snagged it and am so glad I did because it’s so comfortable and I thought it was much cuter on even than it was on the hanger. Plus, $19.99! I may have to order it in other patterns if they make some. I did pair it with some LuLaRoe leggings (they are $20 if you can find someone who sells them) and then these Sanuk Pair O Dice that I got at my local EMS. They are insanely comfortable and I have worn them every day since I bought them. Love that dress!!! Great buy!! !